I don’t usually like short story collections, as by the time I am halfway through, I tend to feel a bit shortchanged by the stories, which can often read more or less the same. It is as though the author had a particular idea in mind bit could not follow through, resulting in a collection of ‘half-finished’ prose. 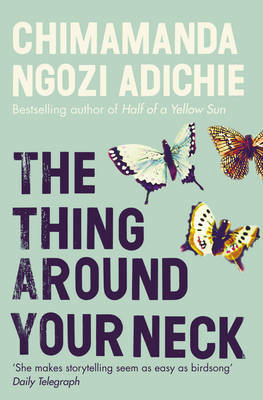 That said I really do like Chimamanda Ngozi Adichie’s short story collection ‘That Thing Around Your Neck‘. Adichie is a rich and gifted storyteller, who clearly defines her characters and immerses you deep into the world they inhabit and the circumstances they are facing. By the story’s end you feel sated, as though you’ve read a mini novel, and in some cases you feel there is grounds for a full novel. All the stories in this collection focus on the themes of family, love, loss, identity, immigration and exile, and as such in the hands of a less skillful writer it would be easy for each story to read the same as the other. But Adichie manages to avoid this with her gentle and graceful prose, which does not shy away from difficult or controversial subjects such as the legacy and trauma of the Biafran War which has scarred the Nigerian consciousness to this day and the now all too frequent riots between the Islamic Northerners and Christian Southerners. Anyone approaching this collection with preconceived notions or stereotypes of Nigerians and Africans in general, find that such notions are gently and at times humorously dispelled with Adichie’s unflinching portrayals. For example, in Jumping Monkey Hill, a young female writer participating in an African writers workshop finds herself defending her story against the criticisms an elderly, lecherous white, male academic who claims that her story of a young woman who walks out on a much-needed job to avoid the sexual harassment of one of her clients, is not authentic. “The whole thing is implausible…This is agenda writing, it isn’t a real story of real people” he says, dismissing the notion that ‘real people’ have agendas too. Furthermore, according to him women are never victims in that “sort of crude way” in Nigeria, nevermind the fact that women are victims in exactly that “sort of crude way” and not just in Nigeria. A point that Adichie goes onto make in the title story, where a young girl newly arrived in the US and staying with relatives, where “they spoke Igbo and ate garri for lunch and it was like home…until your uncle came into the cramped basement where you slept and pulled you forcefully to him, squeezing your buttocks, moaning…And you remembered what he said, that America was give-and-take.” However, this does not mean to say that Adichie ignores the problem realities of life in Nigeria, she addresses it but she also does not try to romanticise or justify it. Her straightforward way of writing realism, reminds me a lot of her fellow Nigerian author Buchi Emmecheta, who once said that she wrote drawing from the material of own personal experiences as by her admission, she was not really that creative, something that I don’t think you could accuse Adichie of. What I like about Adichie’s writing and particularly in this collection, is that she reminds you that people are people, wherever they are from and whatever their background, social status, education, etc. Any perceived differences are at best superficial as they are all bound by their humanity: their ability to love, to grieve, to survive, and to live, as indeed we all are. Her way of writing in the second person, puts you the reader in the place of the character and insists that you remember what it is like to love someone so much that you lose your sense of self in the process, as in The Shivering, and of the quiet, understated yet determined ways of holding onto love and taking a stand in Imitation. Above all, Adichie collection of stories are classic example of storytelling at its best. If you have read her first two novels Purple Hibiscus and Half of a Yellow Sun (reviews coming soon), you will not be disappointed by this but you will want her to write another novel and I for look forward to her next output. Posted on 14 July 2011 15 March 2018 by queenpea77Posted in ReviewsTagged African literature, fiction, just-read, reviews, short-story, women.